I don’t go in for a lot of religion (none, if you want the truth). And yet, this morning I awoke with a phrase from the Old Testament in my head: “Take off your sandals. This is holy ground.” This is the first time Moses meets El at the burning bush in Exodus (3:5). Strange for this old piece of lore to be loitering in my head. Why this, and why now? I haven’t read an old testament story in 20 years or more. So, I let it rattle around in there some, tried to shake loose some message. At first, I thought of how I’d imagined El’s meaning when I was young. Take off your sandals, as they profane the holy ground on which you stand. Shoes, after all, ward our feet through all sorts of journeys. Moses’ ascent up Mt. Sinai must have been an arduous one, with many unsavory steps along the way. Then I wondered at some religious practices’ emphasis on cleanliness, especially of feet. I rather sympathize. Feet are foul things, really. Asymmetric, usually dirty, calloused, easy targets for fungus. In human service work, I’ve washed and dressed more feet than the Pope. 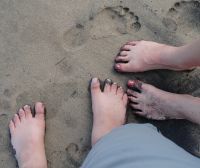 I have touched enough feet to know I never want to see or touch another one. But feet are not meant for attracting partners or breaking ice. They are load-bearing members, all function and minimal form. Finally, it occurred to me to wonder if I haven’t had it all wrong all these years. Perhaps El did not request Moses to bare his feet because his shoes were profane. Cultural traditions that mark the baring of the sole of a shoe or the throwing of a shoe might, if we view this commandment from the god of Moses slightly differently, seem a tad unjustified. What if El did not command Moses to take off his shoes because they would profane the holy ground, but because they might limit his contact with said ground? If we posit something as powerful as a deity and so clean as holiness, would such a being really be troubled by something so mundane as sandals? Perhaps—the mind of such a being must be unknowable. But I’d prefer to think not. Rather, perhaps, El wanted Moses to connect to the Earth, feel the sacredness of it between his toes, as he confronted his god. To shed the protections we devised for ourselves that He never intended. To go vulnerably into his presence. My Wiccan friends have told me of this practice, of going barefoot into the grass to feel the power of Nature through their skin, to be refreshed by it. There is no shame here in dirty feet, because dirt is life. Suddenly, whether theologically apt or not, the reason for this old verse in my head began to manifest. When we enter into the presence of the sacred, we should go as vulnerably as we are able. Our defenses—shoe leather, sarcasm, small-talk, diagnostic labels, whatever—they inhibit our ability to feel the sacred loam between our toes or the human contact between our people. Kirk Schneider wonders how we can enter each encounter, especially each therapeutic encounter, with a sense of awe: openness to wonderment mixed with cultivated naïveté. What is the shoe-leather we have worn to the office to protect us against the million banal and unsavory things we might tread in between here and there? And how do they get in the way of deep sensitivity we need in the here-and-now? Now I can imagine El speaking to Moses a little differently. Take off your shoes, He says, as this is holy ground. Do you see the blood there on the jagged rocks? You won’t always bleed when you cast off your shoes, but to stand amidst the sacred, you must be prepared to do so. Stop for a moment. Wherever you are—on ground or floor—stop and think about the weight of the earth beneath your feet. Concentrate, just for a moment, on how it feels. Imagine the connection between you and your home planet.